Besides stamping, one of my favorite things to do is gardening. I really enjoy getting my hands in the dirt, and watching things grow throughout the summer. 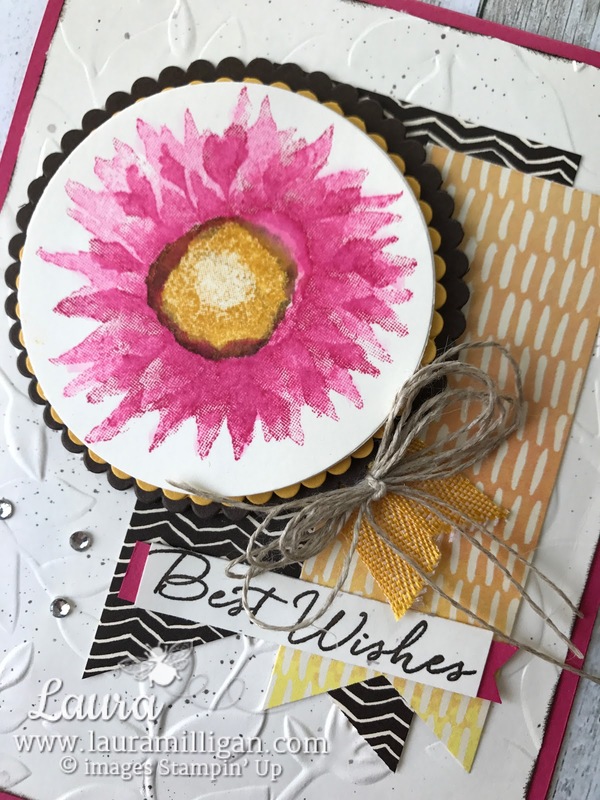 One of my favorite flowers is the purple coneflower - they are actually pink, not purple like the name implies- and they were the inspiration for my card today. I started with a Melon Mambo card base. I used the Painted Harvest Stamp Set to create my flower. 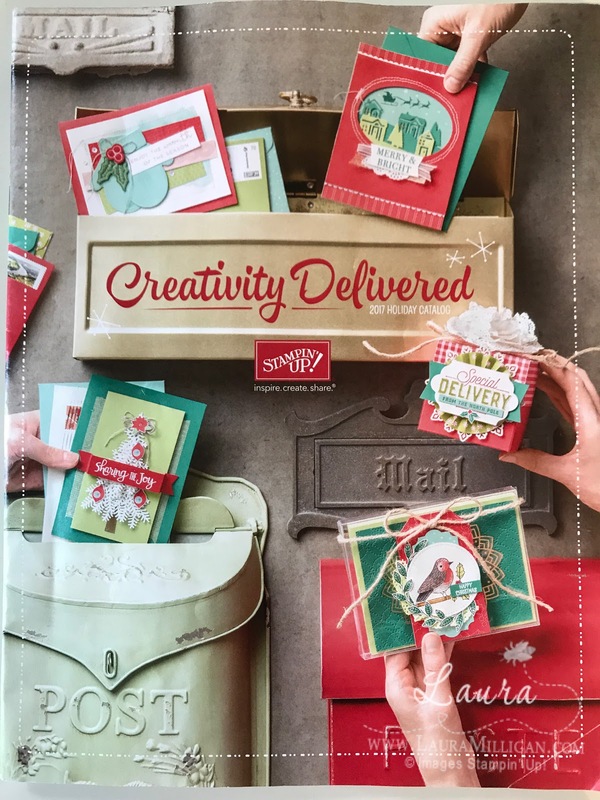 This is a two step stamp set with 13 stamps and is in our upcoming Holiday Catalog. I used Melon Mambo ink - and stamped off the larger of the flower stamps onto a piece of scrap paper, and then stamped it again on a piece of Very Vanilla cardstock. I inked up the smaller flower stamp with Melon Mambo ink and then stamped it over the first flower image. The flower center stamp was first stamped in daffodil delight ink and then I used a sponge dauber to add a little Early Espresso ink around the outside edge. I used my aquapainter to blend the ink a bit. I liked how it softened the edges of the flower. I used the layering circle framelits to cut out the flower, as well as scallop circles in Crushed Curry and Early Espresso cardstock. I attached all three circles together with dimensionals. 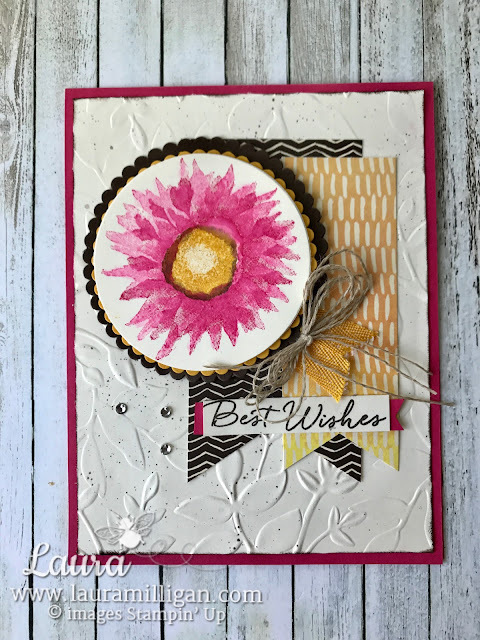 I stamped "Best Wishes" from Blooms and Wishes stamp set with Early Espresso ink and layered this onto a piece of Melon Mambo cardstock to create a tiny banner. The Very Vanilla layer was embossed with the Layered Leaves Dynamic Embossing folder. I sponged the edges with Early Espresso Ink. I then picked up some Early Espresso ink onto an aquapainter and "splattered some color onto the leaves. To finish the card, I added two pieces of Painted Autumn Designer Series Paper (gorgeous paper from the upcoming Holiday catalog), a bit of Crushed Curry Mini Chevron Ribbon, and a loopy linen thread bow. For a little bling, I added three rhinestone basic jewels. Most of the supplies for this card are available now- however, the Painted Harvest stamp set and coordinating designer paper won't be available til Sept. 1, when ordering begins from the Holiday Catalog. If you don't have a demonstrator, I would be happy to serve you in your stampin' needs! Please email me at laura@lauramilligan.com and I will send our current catalogs to you! Melon Mambo - card base 8 1/2" x 5 1/2", scored at 4 1/4"
Designer Paper - 2" x 4" and 1 1/4" x 3 1/2"